When I’m editing, I live in Track Changes mode. But all that markup gets confusing sometimes, even for me. My previous blog explained how I use the Display for Review drop-down to switch back and forth between markup, Final view, and Original view. I do this a lot, to see the effect of my changes and make sure I havenʼt introduced an error or changed the authorʼs intent. So I’ve assigned custom keystrokes to help me work faster. You can too! This blog will walk you through the process of finding the right command and setting up your own keyboard shortcut for it. Once you get comfortable with this, you can create custom keystrokes for all kinds of functions—no macros, no permission from IT, no muss, no fuss. Itʼs completely safe, and quite easy. You’ll be amazed how much more intuitive Word is when you can dictate your own shortcuts. Itʼs particularly helpful when youʼre reviewing an edited manuscript, because you can flip between your original text and the editorʼs changes to see which you like better. Locate the command you want to use. This how-to uses DisplayFinalDoc, DisplayOriginalDoc, and ShowChangesAndComments. Open the Customize Keyboard dialog. On PC, use File > Options > Customize Ribbon and click the [Customize…] button. On Mac, use Tools > Customize Keyboard. Select the command in the Commands list (you may need to set Categories to “All Commands” to find it). Click in the “Press new keyboard shortcut:” box and, predictably, press a new keyboard shortcut. Confirm that you wonʼt override a shortcut you care about, then click the [Assign] button. If thatʼs enough for you, youʼre set! For chatty hand-holding, read on. And if you prefer a macro-based approach, check out this blog by Mike Pope (who is an excellent source for Word tutorials). Remember the “Display for Review” drop-down in the Review ribbon? It’s the circled widget in figure 1. When you change the selection in this drop-down box, you change what’s displayed in your document edits: Final or No Markup (all edits accepted), Original (all edits rejected), and Show Markup or All Markup (does what it says on the tin). Fig. 1—The Display for Review drop-down box, in the Review tab of Word 2010. Even though there are four different commands in this drop-down, Word considers them three different functions: choosing the Final or Original document as a baseline, and showing or hiding changes and comments. (It’s probably much more complex than that, but this is precise enough for our needs.) This means that Word doesn’t give you a native keystroke or command for switching from Final to Original. But with custom keystrokes, we can create the same effect. First we have to find the right command. Sometimes you can do this by hovering over the toolbar icon in the Customize Quick Access Toolbar dialog—for example, if you hover over the Bold button in that dialog, youʼll see that the command is called (appropriately enough) “Bold”. But the functions we want donʼt have individual buttons, so we have to do a little detective work. I like using the Fixed Command lists on the Microsoft standards websites, but you will also find lists in several common reference books, or you can generate your own list directly from Word. With these lists, and a little bit of informed guesswork, you can find what you need. The table below shows the views in different versions of Word, the associated commands, and the keystrokes I decided to assign. Later versions of Word also offer a “Simple Markup” option, which we’ll ignore for this exercise. Because the ShowChangesAndComments command toggles markup on and off, we only need one keystroke. You can choose any keystroke you like; there’s nothing magical about my choices here. That said, start with Alt+ combinations; they’re least likely to be in use already. To create a custom keystroke on a PC, go to File > Options > Customize Ribbon. At the bottom of this box, you’ll see a [Customize…] button for Keyboard shortcuts. Click that button. If you’re on Mac, just go to Tools > Customize Keyboard. Much simpler! Fig. 2—Getting to the Customize Keyboard dialog on a PC. In either case, you’ll see a dialog box like the one in figure 3. It may look a little different depending on your version of Word, but the core functions should all be recognizable. Fig. 3—To assign a custom keystroke, 1) choose the command category, 2) select the command, 3) click in the shortcut key box and press your custom keystroke, 4) click [Assign]. At the top of this box you can filter commands using the Categories list (1). But many of the most interesting commands, including the ones we’re using, aren’t in the filtered lists. So if you don’t see what you want, just scroll down until you see “All Commands” and click that. The Commands list (2) will change to show you all available commands. You will find a box labeled “Press new shortcut key:” (3) below the Commands list. Click in this box. Press the keystroke you want to use—I used Alt+8. Look for a nearby box labeled “Current keys:”—you should see a line of text near it that says “Currently assigned to: [unassigned]”. If so, you’re golden. Sometimes you may find that the keystroke is already assigned, though. For example, if you try to apply the shortcut Ctrl+S Word informs you that this keystroke is “Currently assigned to: FileSave”. If you donʼt want to lose the existing keystroke assignment, backspace and try again until you find a keystroke you like that isn’t in use. Once you’ve got the right keystroke, click the [Assign] button (4) at the bottom of the box. Now you can find more commands and assign more shortcuts, or click [Close] and back out of everything if you’re done. With your spiffy new shortcuts, you can now easily toggle between different editing views without using your mouse. Assuming you start with Final: Show Markup selected, click your keystroke for ShowChangesAndComments (Alt+8 in my case) to turnoff markup and see your manuscript as if all remaining tracked changes were accepted. Click the keystroke for DisplayOriginalDoc (Alt+9) and you’ll see the manuscript as if all changes are rejected, and DisplayFinalDoc (Ctrl+Alt+9) will jump straight to the No Markup / Final view again, without showing you any messy markup. Fig. 4—Custom keystrokes help you switch seamlessly between different document views. You’ve now got a simple way to toggle back and forth to see what would happen if you rejected or accepted a tracked change. Use your ShowChangesAndComments keystroke to turn the markup back on again. Now that you know how to set up custom keystrokes and how to find the commands you need, you can create shortcuts for almost anything you want Word to do. 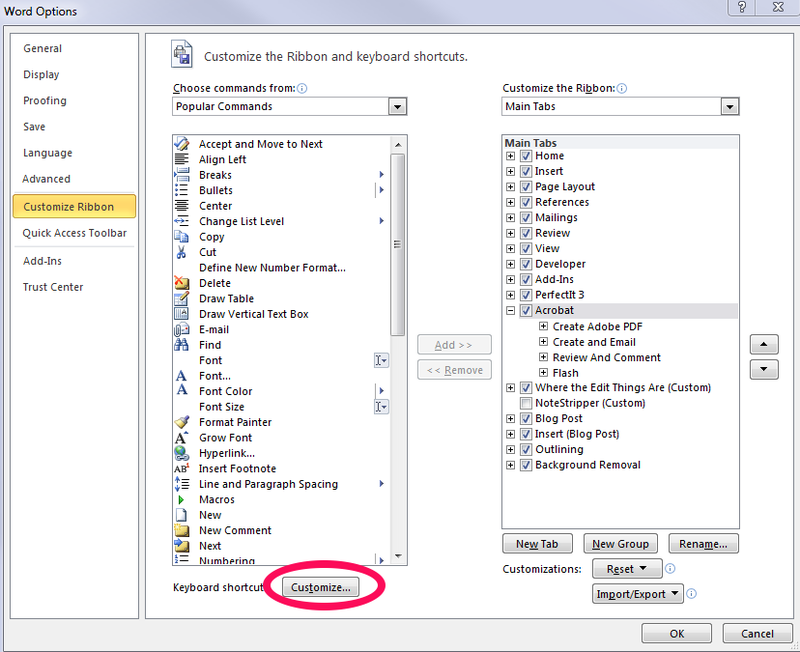 If you find yourself using a toolbar button or ribbon command frequently, try assigning a custom shortcut to save time. I find this makes me vastly more productive. There’s nothing like bending Word to your will so you can work at your own pace, using keystrokes that are intuitive for you. You can even assign keystrokes that are easier for you to reach to deal with mobility issues or combat repetitive stress. My next blog will discuss ways to work with comments more efficiently, along with a few tips for finding other commands you may want to create shortcut keys for. Everyone has a different editing style; mine can be charitably described as “verbose.” And because the majority of my work is line editing—the kinds of intrusive, content-oriented edits that happen earlier in a manuscript’s life—my first pass on a manuscript can be messy. Intimidating, even. I also work with a lot of self-publishing authors these days, and many of them have not used Track Changes before—or at least not at this level. So I’ve decided to launch this blog with instructions to help you, novice author, wade through a messy markup to find your next draft. I’ve used variations of these instructions with several first-time authors now, and they’ve always been well received. I hope you’ll find them helpful too. Note: The screenshots in this blog were all taken on a PC using Word 2010, with highly customized tabs and toolbars, so your screen may look a bit different. The core tools are the same, though, and where possible I’ll point out the differences. Let’s start by seeing what we’re up against. Don’t worry, I’m right here with you, and I promise you can get comfortable with Track Changes. First, get comfortable. Your pristine, perfect manuscript is probably messy and overwhelming now. You knew it would be marked up, but you weren’t expecting this! That’s a completely normal reaction. Being comfortable, relaxed, and alert will help you establish a rhythm. Accept that this will take a few sessions. You didn’t write the book in a day, so you won’t revise it in a day either. No one is expecting that. Just budget your time based on your due date, and work through it a piece at a time. Finally, read your editor’s transmittal note, which probably discusses any overall concerns and may affect how you respond to individual edits. You’ll save yourself time and hassle if you start with that. OK, deep breath! Let’s dive in and start wrangling that markup! Let’s start by looking at a manuscript I worked on a while back. Just look at all that red (blurred to preserve confidentiality). Don’t worry. We’ll get through this together. Fig. 1—A heavily edited Word document. Your screen will look a bit different, because my ribbon and toolbar are extensively customized, but the labeled portions should be familiar. We start with 1) the Review tab active. The Track Changes button is yellow, showing that it’s turned on. To the right of the Track changes button we see 2) a dropdown box (formally, “Display for Review”) set to “Final: Show Markup.” In later versions of Word the equivalent is “All Markup.” If you’re on one of these versions and Word starts out showing you Simple Markup—which hides everything except the change indicators—click the words “Simple Markup” and choose “All Markup” from the dropdown menu to see the full effect of editing. Then have a sip from your cuppa. Below the toolbar, in the manuscript proper, we see 3) a particularly brutal edit. The text is blurred, but you can see the effect. Almost nothing is untouched. It looks worse than it is, though, because of the way Word displays changes. You probably find this view very noisy. I know I do. It’s relatively easy to see that underlined text is new and struck out text is deleted, but it can take some practice to stitch together the new sentence. Fortunately, you can toggle these edits using the Display for Review dropdown (#2 in figure 1). Choose “Original” from that dropdown to see the text before editing. Fig. 2—Choosing “Original” in the Display for Review dropdown. Think of it as a time capsule—but one that forgets the past when you accept the future. Basically, this shows you what your document would look like if you rejected all the suggested edits. It’s a good way to roll back the clock and see what was there before the editor meddled with it. But keep in mind that once you’ve accepted an edit, Word will consider it “Original.” In other words, you can’t use this view to roll back edits that you didn’t want to accept. For that, you need Undo (Ctrl+Z). If you want to see the effect of the edits without accepting them, choose “Final” from that dropdown (“No Markup” in more recent versions or Word for Mac). Fig. 3—When you set the Display for Review box to Final or No Markup, you can see the effect of tracked changes without accepting them. Switching back and forth like this may feel cumbersome at first, but it’s very helpful. As you get used to it you can toggle this setting to put suggested edits in context. You can even add this dropdown selector to your Quick Access Toolbar so you can get to it without using the Ribbon. In some versions of Word, you can toggle markup by clicking on the change indicators in the left margin, which look like red or gray vertical lines. Experiment with this and watch the Display for Review selector; you should see it change from Simple Markup to All Markup and back again. Handy, right? Now that you can see the edits in context you have three choices for every edit: accept it, reject it, or amend it with your own changes. Fig. 4—To accept an edit, highlight it and click the Accept button on the ribbon. Word accepts the edit, removes the ugly markup, and automatically moves to the next change. Fig. 5—When you click Accept, Word automatically highlights the next change. This allows you to step through edits quickly, but Word is highlighting consecutive edited text—which isn’t necessarily what we would consider a coherent edit. It may grab a portion of a sentence, or even a word, or most of a paragraph, depending on what changes were made. So step carefully and be sure the right thing is highlighted. If you accidentally accept something, just press Ctrl+Z to Undo it (Cmd+Z on a Mac). Sometimes you may prefer your original, or you want to revert to your original before making a different edit. In that case, you can reject an edit: STET, we call it. Just highlight it and click the big Reject button on the ribbon. Fig. 6—If you decide you don’t like a change, you can use the Reject button to throw it away. This removes all traces of the highlighted edit. 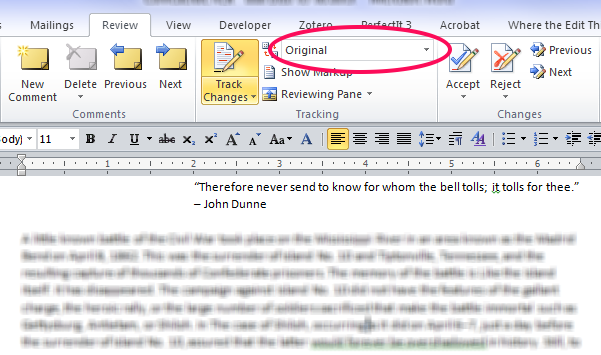 Word erases the edits and leaves your original text in place, then steps right to the next batch of edits. Sometimes you will agree that an edit is needed, but not with the way it was done. Perhaps you don’t like the editor’s solution to a confusing passage, or you have to edit something to address a query. In this case, just make sure Track Changes is turned on and make your changes. Word will track your changes in a different color, preserving a mostly complete history of the text. Why “mostly complete”? That history has some limitations. If your editor deleted a phrase and you replace it with a different one, or if they add a phrase and you replace it with a different phrase, you may find that “Reject” erases both changes instead of restoring your editor’s change. So use the “Final” and “Original” settings to keep track of what you’re doing, and remember the Undo (Ctrl+Z) option. Most of the time, you shouldn’t worry about this—just revise and feel the enormous satisfaction of watching your book take shape. If you have to dig into a really messy passage, you may want to set your view to Final and just write. Word will track everything, and your editor won’t be intimidated by a messy markup. Should I Keep Track Changes Turned On? Some editors or publishers may require you to work in Track Changes; if so, they may lock the document so you can’t make changes without it. Otherwise, if your editor is OK with it (I am) you can click that big yellow button to turn Track Changes off. 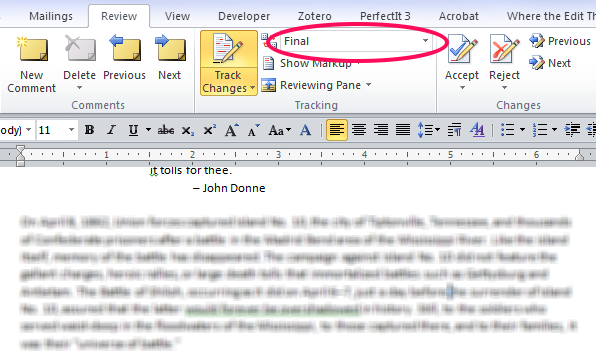 Word will still show the suggested edits, but it will treat anything you do as final. You may prefer to track your changes in some places (because you want your editor to pay special attention to something new) but not in others (because you’re moving and changing a lot, and it’s too messy). Just be sure your editor clearly understands what you’re doing and why, and that you’re consistent when you do it, so you don’t step on each other’s toes or cause confusion. That’s all there is to it! Have a sip from your cuppa, give yourself a pat on the back, and look at your next edit. Accept, reject, or amend, and step to the next, and the next. As you work, you’ll have the satisfaction of seeing that messy markup disappear and a new draft start to take shape. Before you know it, your writer brain will kick in, and you’ll be barreling through. Remember to save frequently so you don’t lose any of your work! If you review edits while you’re tired you may miss important nuances, so try not to work for more than 30–40 minutes without stretching and resting your eyes, and try not to work for more than three hours without taking a real break to rest your brain. Those are just guidelines—if you need more frequent breaks, take them. If you feel your attention drifting, or if you find yourself reacting by reflex (simply accepting or rejecting everything to get it over with), take a break. Get back in the right headspace before you tackle it again. This is one of those “slow down to speed up” situations. It may help to set a timer for the first few sessions, so you get in the habit of taking breaks. You should respect whatever project schedule you’ve established with your editor or publisher, of course, but you need to be in the right frame of mind to revise well. As with so many things, balance is key. If you find your schedule was too aggressive and you’ll need more time, let your editor know right away. Yes, they may be frustrated by a scheduling delay, but they will be even more frustrated by an unexpected scheduling delay. And generally, most people will be understanding. 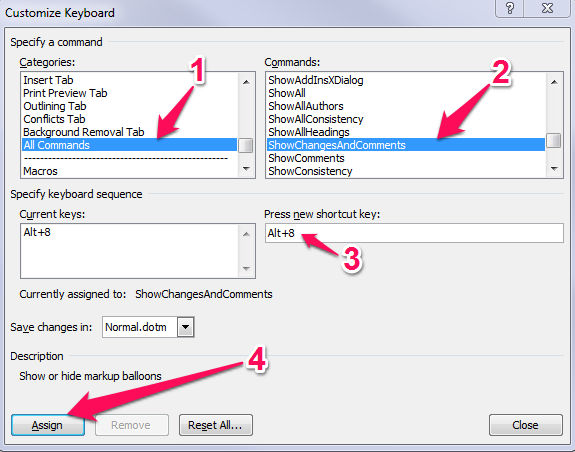 In my next post I’ll walk you through creating custom keystrokes so you can work even faster. And as soon as I talk myself into installing my copy of Office 2016 (soon … soon …) I’ll provide an updated version of this post with screenshots from that version. Meanwhile, if you’ve got other questions about how to manage Track Changes, share them in the comments. I’d love to help you. 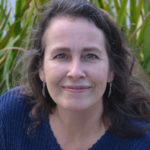 DeAnna is a nonfiction editor who specializes in business text.